Flash to Claire, Jamie and Ian packing the wagon with supplies. They tearfully bid good-bye to Fergus and a very pregnant Marsali who bemoans the absence of her mother. Claire is reminded of Brianna and questions her decision to leave her. She’ll never know her grandchildren. Bibbidi-Bobbidi-Boo! and the Fraser’s are suddenly transported to Fraser’s Ridge complete with stock footage of Grandfather Mountain in the distance. The Fraser’s admire the scenery. Jamie carves FR in a tree to mark the border of his land. He uses wooden posts to mark the boundaries. Suddenly, the Frasers see Native Americans approaching. Jamie throws down his knife and raises his arms in a gesture of good will. The Cherokee turn away. Flash forward to 1971 and Roger is in his University office. (The ministers cat is love-sick cat.) He opens the middle drawer of his desk where we see his copy of Scottish Settlers in Colonial America and the drawing of Roger and Bree from the Highland Games. Bibbidi-Bobbidi-Boo! The book falls open to a reference to Grandfather Mountain and a mention of Fraser’s Ridge. As Roger talks, we are shown the Fraser’s working on their land. We see Clarence pulling a log. Jamie hammers in wooden stakes to mark the dimensions of the cabin and explains the layout to Claire. (Hint: Remember these stakes.) They discuss beef jerky (Mmm!) and a shed for drying meat. Suddenly Ian comes running! The Cherokee are coming. This time they throw down those wooden stakes Jamie used to mark his land. Flash forward to 1971Roger opening a large envelope. There is a copy of Jamie’s signed land grant. (I told you it would resurface.) and a letter from a woman in England mentioning James Fraser and his wife Claire, the healer. Roger phones Brianna to tell her the news. We’re briefly introduced to a new character, roommate Gayle and her French Bulldog. (This is Carrot who just happens to belong to Maril Davis. I admit he is cute, but a horse and a dog and still no pig? Come on people!) Brianna tells Roger how much the news means to her. Back to 1768 at night in the Fraser’s temporary shelter where Jamie and Claire discuss whether to stay or go. 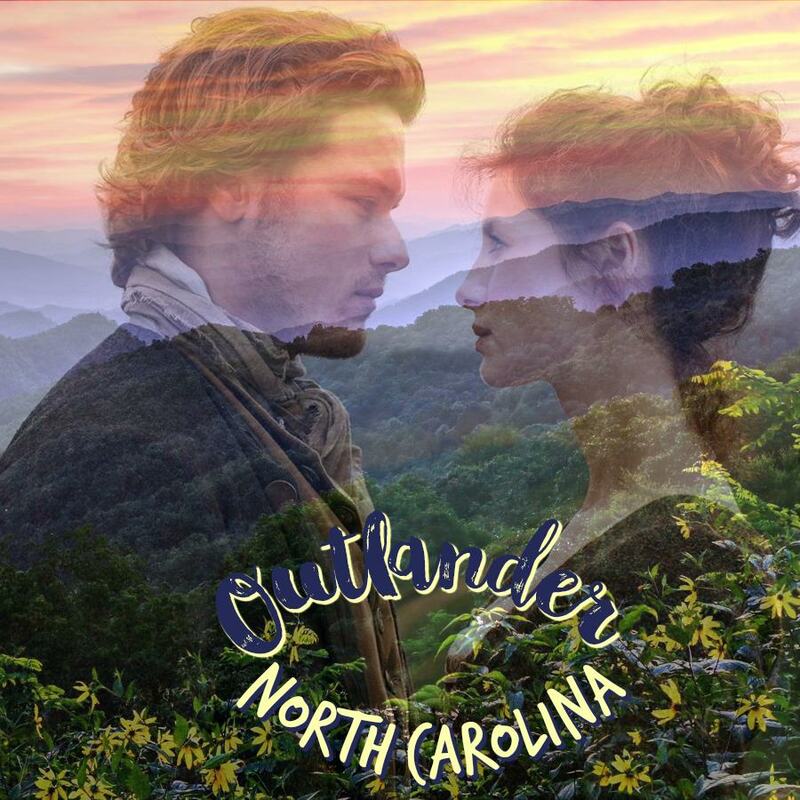 Jamie tells her, “I canna say what it is to for me to feel the rightness of this place…The mountain spoke to me.” They decide to send a message of good will to the Cherokee. Later that night they wake to Rollo’s distant barking. They venture out with loaded rifles to find their meat stollen and Finley the horse limping toward camp with a bear claw wound on his side. Jamie visits John Quincey Myers who tells him the Cherokee call this creature a “ Tskili Yona”. “ Yona” means bear. Myers is cooking some kind of meat draped over sticks. (I wonder what kind of meat that is? It almost looks like bacon! OMG!) Myers advises Jamie to take tobacco to the Cherokee as a peace offering and teaches Jamie the Cherokee word for hello”Siyo ginali.” (Thank goodness for closed caption TV.) Myers offers to take the tobacco to the Cherokee for him. Back at Fraser’s Ridge, Ian repairs a fishing net while Claire guts a fish. We learn that everyone can knit except Claire. (Hey, even I know how to knit!) At nighttime we see the Cherokee in the woods. The Fraser’s wake once again to noise and Rollo winning. They follow Rollo into the night only to discover a mauled John Quincy Myers. He drags the manbear on a litter to the Cherokee camp to broker peace. Flash forward to 1970’s at Reverend Wakefield’s old home. Fiona shows Roger a copy of an 18th century newspaper that reveals the Fraser’s have died in a house fire around 1777. Back to 1971. Roger telephones Bree and gets Gayle instead. Gayle informs Roger that Bree flew to Scotland a couple of weeks ago to visit her mother. In December 1996, Diana Gabaldon created a rather cantankerous animal character known as “the White Sow” in her book “Drums of Autumn”. In 2016, the White Sow joined Twitter, created a Facebook page, and began creating photos, gifs and videos to entertain. According to the White Sow, “It has always been my deepest desire to become comic relief.” The White Sow lives in North Carolina, of course. You can find her on Facebook at https://www.facebook.com/whitesow1/or on Twitter at @whitesow1.